Few PAF-replica makers can claim to be using Gibson’s actual 1950s machines. Huw Price asks: does it make a difference, or is it a wind up? ThroBak believes those few original machines used to wind the coils of classic Patent Applied For humbuckers each added their own unique tonal signature, and actually bought and refurbished four of the same winding machines Gibson used in the 50s to make PAFs and P-90s. So, many ThroBak product names refer to the winding machine used in the production process, and the KZ-115 MXV set here was wound on a Geo-Stevens KZ/LP-115 ‘rescued’ by Les Paul from the Kalamazoo factory before Gibson’s move to Nashville. This machine created ‘centre- focused’ coils, which are much fatter for fewer turns of wire compared to other machines, such as the Leesona. KZ/LP-115 coils are also said to have more scatter and a wider magnetic aperture. All components here are vintage-accurate: the review set was supplied with long alnico 2 magnets, but customers can opt for alnico 4 and 5 instead. You can also specify new or aged covers in nickel or gold, with vintage-correct copper-free plating. This ThroBak set ticks pretty much all the boxes for authenticity. They’re microphonic enough for knocks on the body to come straight through the amp; they’ll sustain notes for aeons without high gain; turn down your volume controls and they clean up without losing clarity or treble; or adjust your touch to go from a clean shimmer to crunchy bite. Having said that, the ThroBaks do have a slightly different tone to the PAFs I’m familiar with and the Monty’s replicas I use for reference, in the upper mids and treble frequencies. 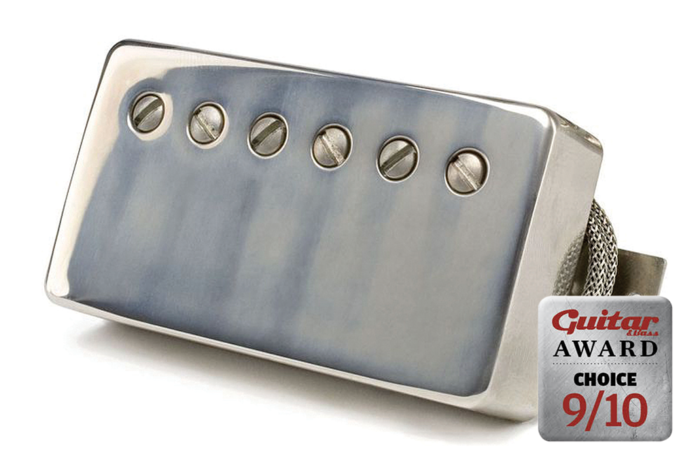 Like genuine PAFs, the ThroBaks are bright pickups, and far clearer than the vast majority of humbuckers. 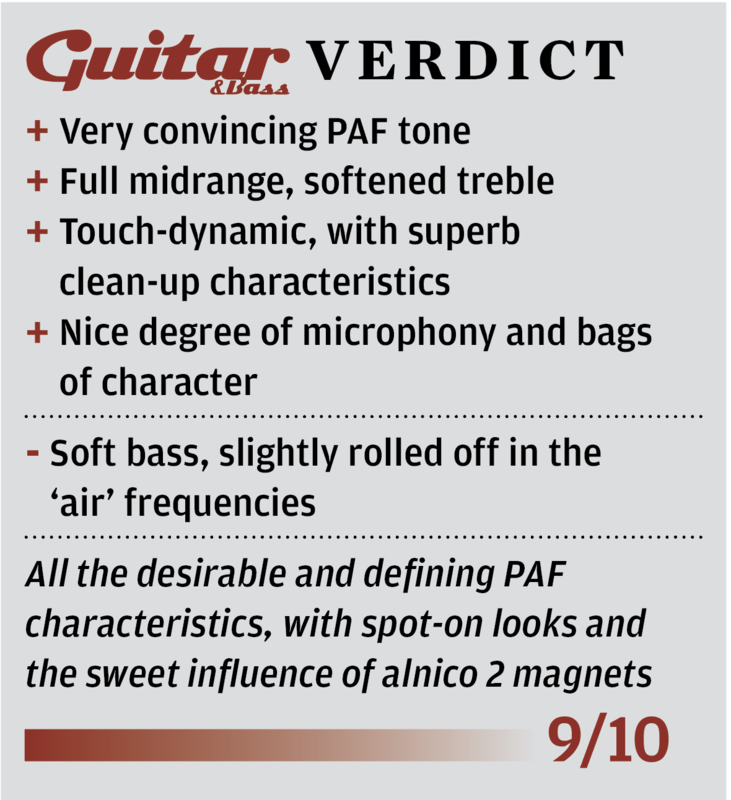 However, I’d describe the alnico 2 tone as more direct and less complex than 4 or aged 5. So the emphasis is on frequencies closer to the fundamental, but you’ll hear fewer harmonic overtones. This translates to a very full and forward midrange, with a smooth and vocal delivery on the neck pickup. Single notes sound very rounded, and there’s a well-articulated punchy attack at the front of notes. Bass notes can sound a bit soft and lacking in definition, but a woody smoothness gels notes together beautifully. Great if you appreciate the saggy softness of a Les Paul though a 5E3. In the bridge position, the alnico 2 doesn’t provide the airy jangle of real PAFs. However, I do like the wiry midrange push with its slightly nasal upper midrange and clear string separation, though neither pickup is quite bright enough to pull off the Fender-on-steroids trick some PAFs can. The ThroBaks certainly thrive on drive. The bridge delivers a raw bark and percussive low-end thump. The treble stays sweet, too: there are fewer harmonic overtones to clutter up drive, so the tone retains its clear definition. Overdrive accentuates the contrast between the bridge and neck; the latter gets smoother while never losing its expressiveness. Yet for PAF aficionados, it’s all about the bloom, which is the generally accepted term used to describe the way PAFs have of shifting harmonics as notes are held. You hear overtones develop through the sustain to drift over the original note. It’s a hallmark of the real thing – the ability to bloom sets the pretenders apart from the true replicas. This set does indeed bloom but, given the softened treble, rather than an ethereal and almost eerie shift in the upper frequencies, you hear a more subtle bloom in the upper mids. The KZ-115 MXVs are undoubtedly a superior set of PAF replicas. If you need pickups to sweeten and soften the edges of an amp that can veer towards harshness, the alnico 2 tone could be just what you’re looking for. These will also lend pseudo-semi-solid ES-335-type qualities to the bass and treble of a Les Paul. For those who want scooped midrange bite of alnico 5 or the brighter balance of alnico 4, you’ll find those on the dropdown menu when you order from ThroBak’s website. On this evidence, I’d expect great things.